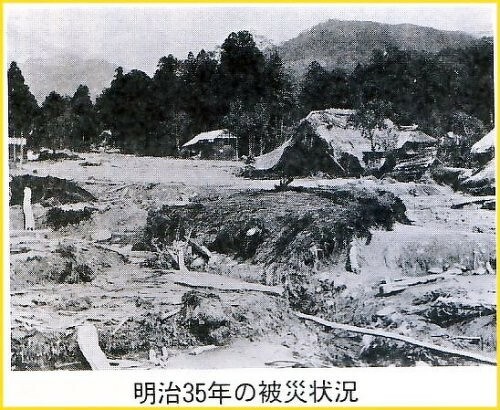 Actually, only *in the past three decades, we had some natural hazards like the landslides at Hiramaru, Kamibaba, etc in the western part of Arai district, the *floods of Seki-river and the avalanche of mud and rocks at Shirotagiri in Akakura district. According to this booklet, the avalanche of earth and rocks attached Nishinoya in Yashiro Village at that time (present Nishinoya, Arai district, Myoko City) on May 17th, 1902 (Meiji 35). This only one picture has been very carefully preserved for more than 100 years. 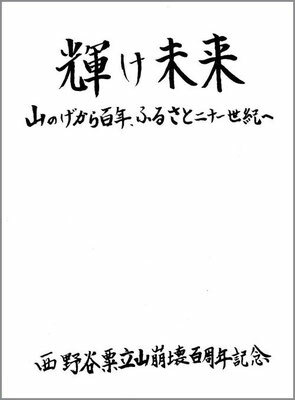 In 2002, Heisei 14 which was the 100th year since that hazard; this booklet was published so that we must never forget it forever. 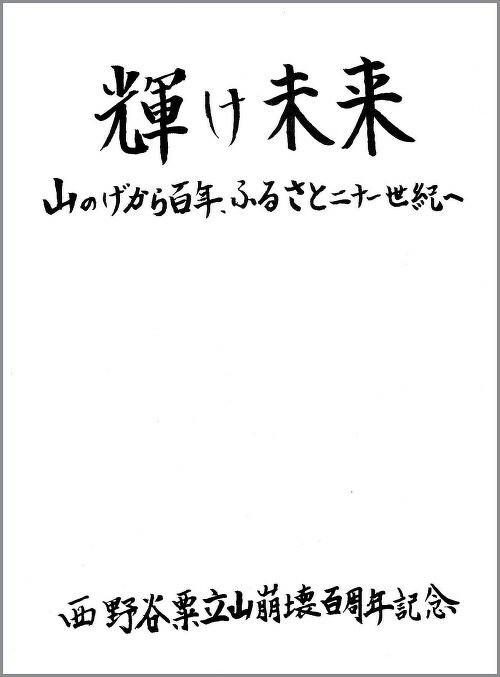 By chance, this booklet was presented to me twelve years ago because “Shihoya in Arai Town” was written on a page about “Notes of those who had given the *get-well gifts” of it. It e.g. 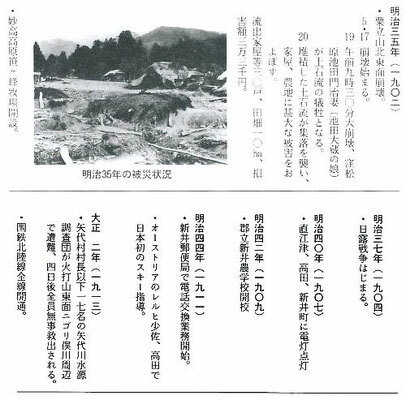 reads that “the avalanche of earth and rocks looked soot and smoke covering us and huge mountain wave, tsunami made the people cry only.” … I am not willing to write the detail here. There are several warnings written for their *posterity in the booklet, whose title is “Shine Your Future”. E.g. in one year before that disaster, Meiji 34: “lots of cracks were found at the north-eastern part of the top of Awadachi-yama by some people collecting *edible wild plants.” … and so on. Whenever reading this booklet, “Shine Your Future” I carelessly left on a bookshelf as one of *classical writings, I am moved by the ancestry who must have felt “painful *consideration for their posterity”. 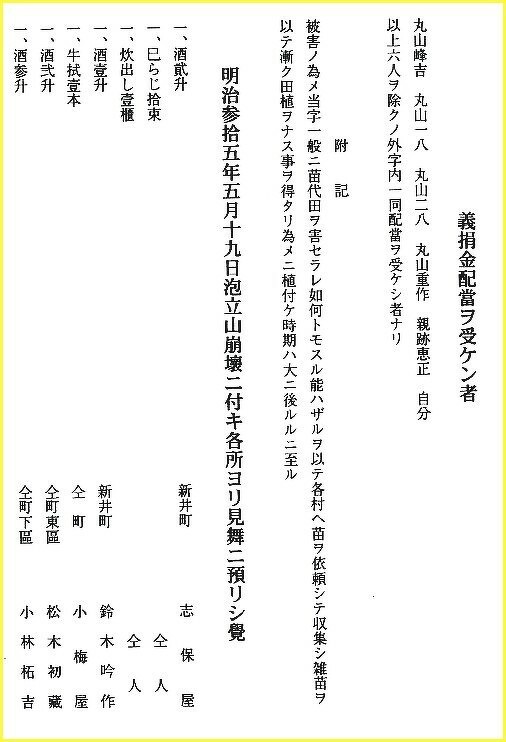 There is no “critical locations of damage from landslide” at our *inhabited areas in Japan; it is warning us. 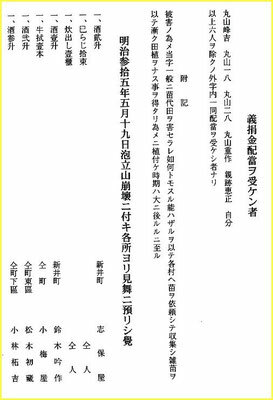 PS: Yoshy has no idea of correct pronunciation of “粟立山”; “Awadachi-yama”, “Awadate-yama” and whether its voiced sound mark is needed or not. Would you e-mail to me if you know?